The West Bengal CM had been sitting on the dharna since Sunday night at the Metro channel in Esplanade area. Kolkata: TMC supremo and West Bengal Chief Minister Mamata Banerjee on Tuesday called off her ‘Save The Constitution’ dharna against the CBI attempting to question the city police chief in ponzi scam cases, calling her sit-in a “victory of the Constitution and democracy”. The dharna which lasted for almost 72 hours ended after the Supreme Court on Tuesday directed Kolkata police commissioner Rajeev Kumar to appear before the CBI and “faithfully” cooperate into the investigation of cases arising out of the Saradha chit fund scam, while it making it clear that he will not be arrested. To avoid all “unnecessary controversy”, the apex court also directed the commissioner of Kolkata police to appear before the investigating agency at a neutral place in Shillong, on such dates as may be fixed by the probe agency. 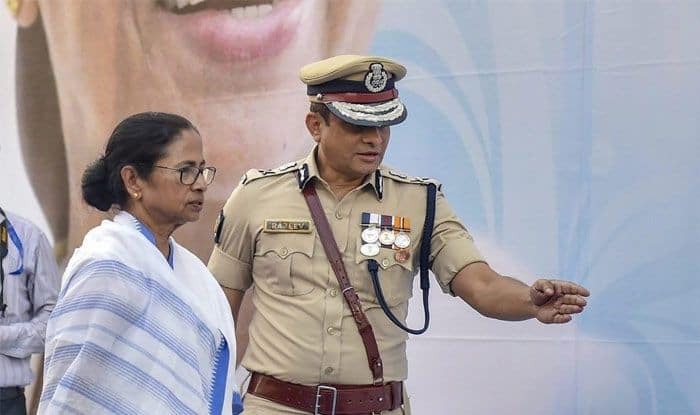 Hours after the top court order, the Centre asked the state government to initiate disciplinary proceedings against Kolkata Police Commissioner Rajeev Kumar for “indiscipline” and violation of services rules. In a communication to the West Bengal Chief Secretary, The Ministry of Home Affairs (MHA) said that as per the information received by it, Kumar sat on a dharna along with some police officers with West Bengal Chief Minister Mamata Banerjee at the Metro Channel in Kolkata, which is prima facie in contravention of the extant provisions of AIS (Conduct) Rules, 1968/AIS (Discipline & Appeal) Rules, 1969. The West Bengal CM had been sitting on the dharna since Sunday night at the Metro channel in Esplanade area, the spot where she had held a 26-day fast against the acquisition of farm land for the Tata Motors small car unit at Singur in 2006. She also alleged that the BJP is “blackmailing” people by using central agencies like the CBI against them and then getting them into the party fold. She said once the people who are being blackmailed by the BJP join the saffron party, the cases lodged against them by the central agencies are dismissed. “Once you join the BJP, then there will be no cases. There will be no CBI, no ED, no I-T (Income Tax Department) against you,” she said. On the other hand, the BJP also claimed moral victory over the Supreme Court order on the Kolkata Police Commissioner, saying that it was a “tight slap” for the Mamata Banerjee government in West Bengal and has brought her “political histrionics” to a screeching halt. Union minister Smriti Irani cited the court’s direction to Kolkata Police Commissioner Rajeev Kumar to appear before the CBI for questioning at a “neutral place” like Shillong to claim that it shows a state of lawlessness exists in West Bengal. Addressing a press conference, Irani said the BJP lauds the order which, she asserted, brought “anarchist” Banerjee’s “political histrionics” to a screeching halt. She said the Supreme Court has ensured that a free and fair investigation takes place, while putting constitutional restraint on “didi ki dadagiri” (Mamata’s intimidation tactics). Banerjee’s “manufactured protest” is an attempt to protect those who “looted” over 20 lakh investor’s money in the chit fund scam, Irani alleged. Taking a swipe at the Trinamool Congress chief after she claimed a moral victory following the court’s order, Irani said Banerjee has been left with egg on her face. She also alleged that the BJP is "blackmailing" people by using central agencies like the CBI against them and then getting them into the party fold. The BJP also claimed moral victory over the Supreme Court order on the Kolkata Police chief, saying that it was a "tight slap" for the Mamata Banerjee government. Centre asked the state government to initiate disciplinary proceedings against Rajeev Kumar for "indiscipline" and violation of services rules.